Nowadays, it’s rare to find a truly unique device in the mobile technology sphere. Most of the major tablet and smartphone manufacturers play it safe and stick with the same old formats, which results in a startling lack of diversity. Pipo is clearly one company that’s willing to swing for the fences by delivering something radically different. With a little luck, the new Pipo X9 could become a cult classic. At first glance, the Pipo X9 looks somewhat like a wireless router with an LCD attached. It’s shaped like a wedge with a rear thickness of 60mm tapering to less than an inch in the front. Thanks to a lightweight yet durable hard plastic housing, the whole package weighs in at just 630 grams. It boasts an 8.9-inch touchscreen display with 1920×1200-pixel resolution as well as an adjustable antenna. The Pipo X9 is powered by an energy-efficient yet zippy quad-core 2.16GHz Intel Atom Z3736F backed by 2GB of RAM and up to 64GB of SSD space. In the peripheral connectivity department, there are 4 USB ports, an RJ-45 LAN port and a micro SD slot for additional storage. The Pipo X9 also comes with an HDMI port for streaming HD video to a larger screen. Besides the unusual hardware setup, the thing that really sets the Pipo X9 apart is its dual-boot operating system configuration. It comes pre-loaded with both Windows 10 and Android 4.4 KitKat. That means you’ll get access to apps like Skype and OneDrive as well as Quick Office and Google Now. As such, the X9 doubles as a content creator and a consumption device. As you might expect, the X9 comes with the standard issue Wi-Fi and Bluetooth but not a whole lot else. While Pipo doesn’t make any X9-specific peripherals, anything that can be hooked up via USB such as a keyboard or a mouse will work under both operating systems. Since it doesn’t feature an on-board battery, the X9 comes with a 1-meter DC power adapter plug. When you first fire up the X9, it gives you 10 seconds to choose between Windows and Android. If no selection is made, it defaults to the last operating system that you used. 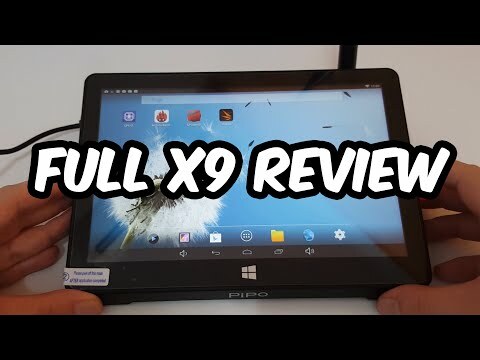 Thanks to its respectable Intel silicon, the Pipo X9 performs admirably for such an inexpensive device. However, Windows 10 does run noticeably slower than Android under similar web-browsing and streaming conditions. On the one hand, the Pipo X9 is an extraordinarily versatile device that can act as a TV box, a kiosk or a tablet. It also manages to give users an array of choices when it comes to operating systems, a rare feat in the mobile world. On the flip side, it’s not exactly a beast when it comes to raw computing performance. The Pipo X9 is an intriguing machine that manages to do a little bit of everything in a moderately respectable fashion. Having one in the kitchen or the garage would allow users to quickly look up information while they’re working. It could also function well as a community tablet for common areas. Considering the fact that it’s currently retailing for under $130, it’s a bargain for the right consumer.